1955-58 Maico were well-known for their motorcycles from 1932, and paostwar production included scooters such as the Maicoletta. In 1955 they acquired the designs of the Champion and continued production of the 400 2-seater and 500G estate car. Under Maico ownership, 783 400s and 21 500Gs were made. 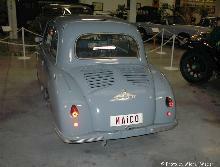 From 1956 to 1958 they made the Maico 500 4-seater 2-door saloon with 452cc vertical twin 2-stroke Heinkel engine, and in 1957 announced an attractive little sports car with the same engine and a body by the Swis coachbuilder Beutler. Only about 10 of these were built, but production of the 500 saloon reached 6301 before cars were discontinued in 1958 and Maico returned to motorcycles exclusively.